Sometimes it's amazing what you can come up with in the spur of the moment! We needed some additional pictures for my upcoming baking cookbook and we needed something colorful... an editor suggested a bread with carrot flecks. Carrot flecks? Who makes bread with carrot flecks?? So I strummed my fingers for a while... what can I make? What can I make? And then it came to me... why not make a very lightly sweetened version of a carrot cake... put it in a loaf and make it a bread! Why not? One of my favorite aspects of this new book is that it will include a chapter of lower glycemic gluten-free baked goods. This means the primary ingredients will be almond flour and coconut flour. There's also going to be a vegan chapter as well (although not a low glycemic, vegan chapter!) so this cookbook will have a LOT of different options for people on all kinds of gluten-free diets. While this bread isn't anywhere NEAR as sweet as a carrot cake would be, it definitely has hints of carrot cake and a lovely sweet flavor accented by ground cinnamon. It's a snap to make and has a great texture. Try it out and tell me what you think! 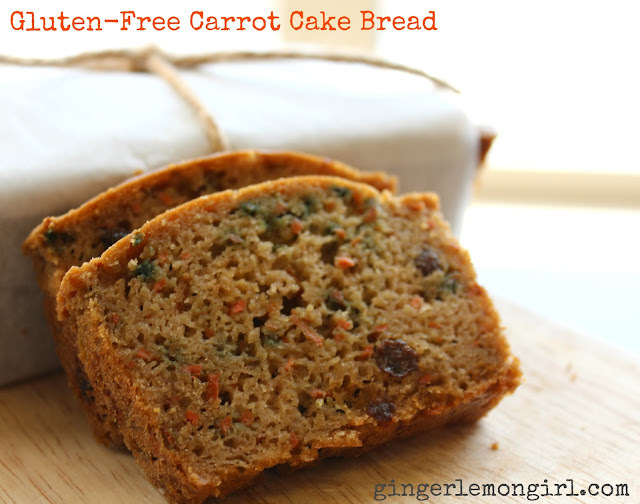 If you're not a fan of banana bread, this is a perfect alternative! It's also really tasty spread lightly with sunbutter or almond butter! This moist, slightly sweet loaf is perfect for breakfast. If you can tolerate dairy it is delicious with a smear of cream cheese. It's also a fun and tasty base for a peanut butter and jelly sandwich! Preheat oven to 350 degrees. Heavily grease 2 (7 1/2" x 3 1/2") loaf pans with non-stick cooking spray or coconut oil. In a medium bowl whisk together blanched almond flour, arrowroot starch, ground cinnamon, sea salt, and baking soda. Set aside. In a large bowl mix together olive oil, coconut sugar, eggs, carrots, almond milk, and apple cider vinegar Stir the whisked dry ingredients into the wet ingredients. Fold in the raisins, if desired. Divide the batter evenly between the two pans. Bake for 350-40 minutes until a toothpick inserted in the middle comes out clean and the tops of the loaves are golden brown. Allow loaves to cool on a wire rack for one hour before slicing and serving. 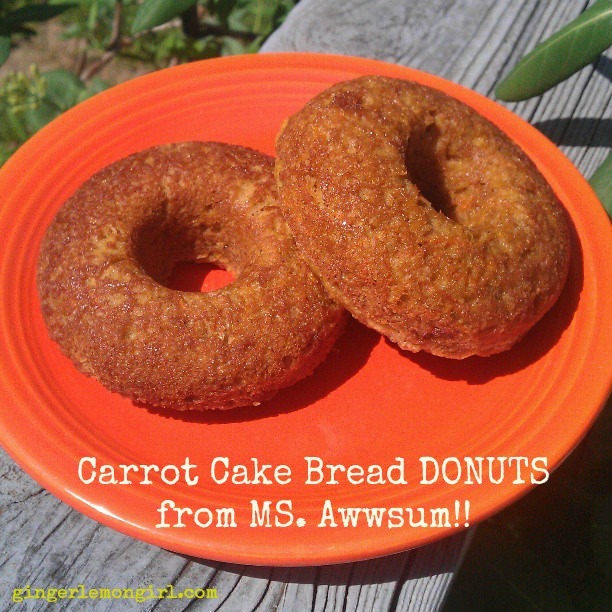 My friend Diane decided to make Carrot Cake Bread DONUTS instead!! (Pure Genius Diane!) Simply pour the batter evenly into well-greased donut pans and bake at 350 degrees for 15-18 minutes until a toothpick inserted in the middle comes out clean! 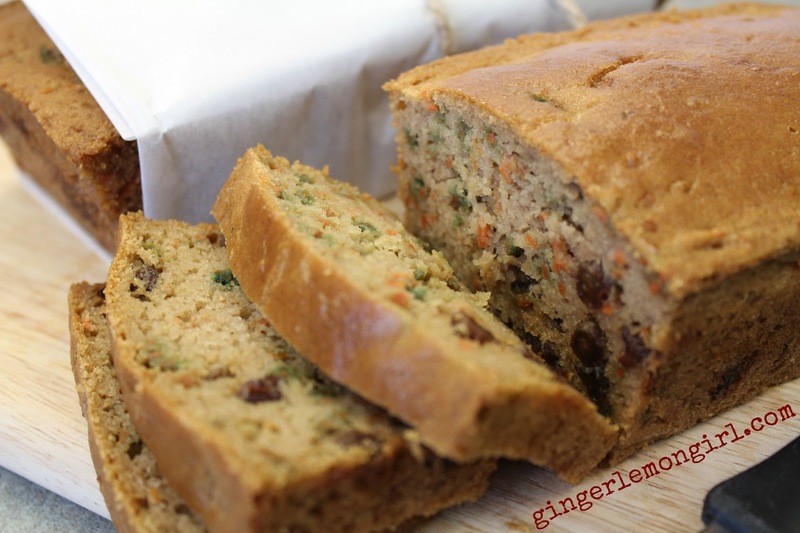 This cake bread looks so moist and delicious! That looks lovely!!! May I ask what the green flecks are? Thank you for sharing the recipe! I am going to try this soon, tweaking it to match the ingredients in my cupboard, of course! I refer people to your website all the time. Keep on cooking! This looks fantastic!! I have lots of food allergies, almonds being one. Any suggestions for what might work in place of the almond flour? Can you eat any other types of nuts? Any nut or seed flour should work just fine in this bread! I love that your new cookbook will have lower glycemic index recipes. We have lots of diabetics in our family, so with that kind of gene pool, I am SO careful about the glycemic index of what I feed our two young boys. And now we need to be gluten free. I'm feeling the pain of how hard it is to be both gluten-free and low glycemic.